. . . was a teacher of English Literature at Magdalen College, Oxford for thirty years and Professor of Medieval and Renaissance English Literature at Magdalene College, Cambridge from 1954 until his death in 1963. Lewis is recognized today as the best-selling Christian author of all time with over 200 million copies of his books in print. These works include: The Chronicles of Narnia, Mere Christianity, The Screwtape Letters and numerous other books and essays. Lewis's life and marriage to fellow writer Joy Davidman Gresham was immortalized in the 1993 film Shadowlands starring Anthony Hopkins and Deborah Winger. The Walden Media film versions of The Chronicles of Narnia are introducing a whole new generation to Lewis's works. Click the link above to listen to my conversation with Alister McGrath about his book, If I Had Lunch with C. S. Lewis. 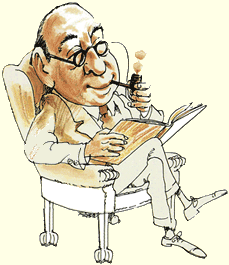 Click here to check out the best C. S. Lewis web site! Click here to download and listen to C. S. Lewis' one surviving BBC talk from the series Beyond Personality.